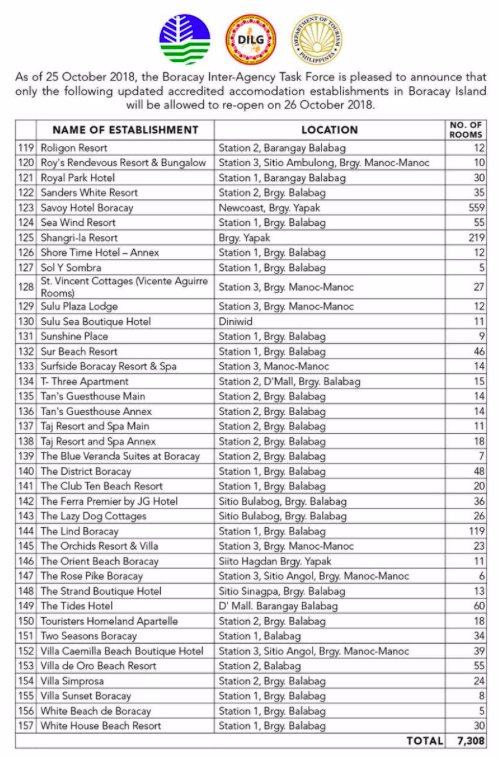 As Boracay prepares to welcome the return of tourists tomorrow, a final tally of “compliant” hotels has listed 157 premises offering 7,308 rooms. 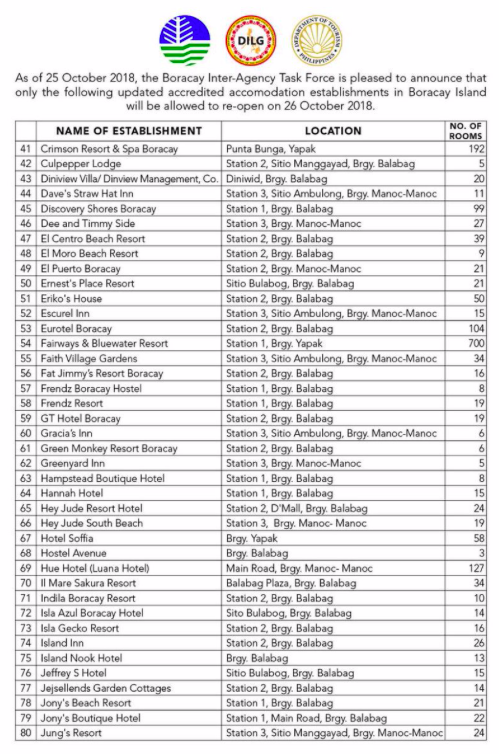 Speaking today (Thursday, October 25) Environment Secretary Roy Cimatu also said that 43 restaurants had fully complied with the government’s environmental policies. 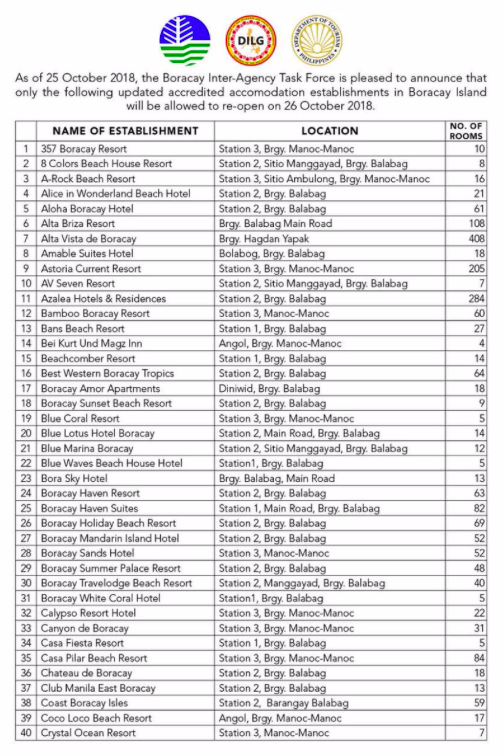 These include 11 beachfront restaurants and 32 establishments in other parts of the island. Ninety-three other businesses, such as laundry shops and spas have also complied with government regulations, he added. Previous lists issued earlier this month listed 68 and 115 compliant accommodation providers. Under the island’s new policy, a commercial establishment may operate only if it proves that it did not violate the Clean Water Act, Clean Air Act, garbage disposal laws and observed the 30-metre easement rule along the seafront. This means they are not illegally discharging waste water, are segregating their garbage properly and are not disposing hazardous waste, Cimatu said. Tourism Secretary Berna Romulo-Puyat has earlier said the government will “padlock” non-compliant establishments will be “padlocked” to prevent them operating from tomorrow. 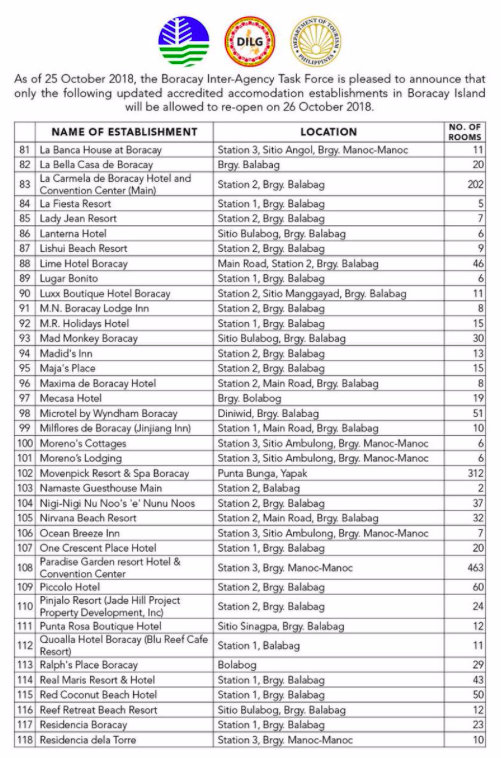 Non-compliant hotels that booked guests must give a refund, otherwise they could face charges for fraud, Environment Undersecretary Benny Antiporda said. Meanwhile, 2,100 “front-line workers” on the island have received free training sessions and seminars from the Department of Tourism. The trainees have included boatmen, jetty port checkers, ticket collectors, land transport drivers, tour guides, travel and tour operators, hotel and restaurant waiters and food servers, massage and spa therapists, manicurists, vendors, souvenir gift shops salespersons and water sports activity leaders. ALSO READ: Palace slaps down Boracay casino firm: The president has said NO! Also today, the police have announced the deployment of hundreds of additional officers to the island. The island was shut down for six months of ‘environmental rehabilitation’ after President Duterte described it as a “cesspool”. It is now reopening with a raft of new rules and resistrictions, including a cap on tourist arrivals to just 6,405 per day. Nigi nigi nu noos has huge rats!